I spend a lot of time reading things on the internet. Every month I’ll post a collection of lines from articles and that made me giggle, blush, gasp or murmur in awe. Sometimes I scoff, mainly at this worthless ‘unclothed emperor’ brand of journalism they publish in the UK. I’ll let you know if I’m mad with a resounding WRONG after the citation. Also, I just came up this idea two weeks ago, so it only covers half of December. 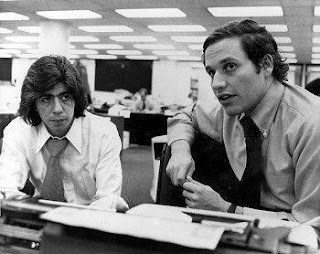 Today’s newspapermen of honor are Woodward and Bernstein. Enjoy! Sophie was a truly beautiful girl I used to be friends with, but hadn’t seen in 15 years. I was surprised to hear that she was still single and was excited to meet her again. At dinner, I found myself sitting opposite something that surely would have been happier hunting for truffles in the forests of France or grazing on the grassy marshlands of Canada. My friend’s wife had told me that Sophie still had the body of a 20-year-old. Maybe she did . . . dismembered in her freezer at home. Once we Americans have ushered a writer into the contemporary pantheon, we will lie to ourselves to keep him there… [Denis Johnson] is often called “a writer’s writer,” with the customary implication that this is far better than being a reader’s writer. When I worked at CIA headquarters in the early 1990s, I once suggested to a friend who worked in counterintelligence that up to a third of all CIA agents could be doubles. He said the number was probably much higher. I know it’s hard to believe, but during the past 12 months I sometimes went two or three weeks in a row without finding anything to mock, deflate or be disappointed by, and my inner curmudgeon was frequently elbowed aside by a wide-eyed, arm-waving enthusiast. More than anything [top 10 lists] are a public ritual, which is their most valuable function. I tell you what I liked, and you either agree with my list (which flatters us both) or denounce it (which flatters you). It’s a perfect circle... [These two films] made me feel like the woman in the start of Orson Welle’s film “Touch of Evil” who says, “I’ve got this ticking noise in my head,” just before she’s blown to smithereens by a time bomb. I’m still intact (more or less), but these films shook up my world in the best possible way. Directed by Cristian Mungiu, [“4 Months, 3 Weeks and 2 Days”] is one of those putatively dark, difficult movies that industry mouthpieces try to use as proof that critics are out of touch with the audience when it is actually the audience that is out of touch with good movies. Americans consume a lot of garbage, but that may be because they don’t have real choices: 16 of the top box-office earners last weekend — some good, almost all from big studios — monopolized 33,353 of the country’s 38,415 screens. The remaining 78 releases duked it out on the leftover screens. The second stanza of Friedrich Schiller’s poem that is set to the music in “Ode to Joy,” coming on the heels of a chorus that invites the world’s “millions” to “be embraced,” ominously ends: “But he who cannot rejoice, let him steal weeping away.” With this in mind, one recent paradox of the marcia turca is difficult to miss: as Europe makes the final adjustments to its continental solidarity in Lisbon, the Turks, despite their hopes, are outside the embrace. …The collection has been received with rapture by many critics, who celebrate this offering as a unique window into Pamuk’s interior life. Indeed, it is precisely that. Unfortunately, it seems that Pamuk’s interior life is largely that of a lugubrious poseur… For page upon page, Pamuk stresses in these self-enamoured tones that he is a man who really likes to read books. Good ones, too, by famous writers like Dostoyevsky and Borges – not, you know, easy ones. He’s different from other Turks, you see. But he’s not like the Europeans, either. He’s an outsider, eternally apart, rejected by all, accepted by no one (the Nobel committee aside). Life hurts. A seagull croaks. I don’t have a mobile phone, I don’t have a computer or an iPod – I don’t have any of that crap. I think it’s much better to be like Amy Winehouse than to be aged 24 and stuck in front of a computer all day… If you are stuck in front of a computer you aren’t actually living, you’re living by proxy. [Celine] Dion is the Antichrist of the indie sensibility, an overemoting schmaltz-bot who has somehow managed to convert the ethos of Wal-Mart into sine waves and broadcast them, at kidney-rupturingly high volume, directly into our internal soulPods. A book pondering the aesthetics of Céline risks going wrong in about 3,000 different ways. Most obviously, it could degenerate into one of those irritating hipster projects of strategic kitsch-retrieval, an ironic exercise in taste as anti-taste in which an uncool phenomenon is hoisted onto a pedestal of cool simply as a display of contrarian muscle power. Robb learned from his travels that the centralization process was never as rapid or as complete as previously thought. In 1800, only 11% of the population spoke French (the official Parisian version) and a hundred years later only about 20% spoke it. Looking at “Così fan tutte” as Mozart’s “late style” or as some kind of summing up is hindsight invented by the people who outlived him. He didn’t see it as “late style” at all. Mozart — always living high and never the impoverished garret dweller of myth — had financial security in sight and more music to write. The death of Baudrillard left a gaping hole in the cultural landscape. Suddenly, we lack a great POFT — a Pointlessly Obscure French Thinker. Baudrillard, like Kristeva, Foucault, Lacan and many others, was a poseur and rhetorician. But, like some of the others, though certainly not Foucault, he was also a very brilliant man. His insights into the constructed nature of contemporary reality were, while usually buried beneath pointless obscurity, scintillating. If the French could shake off the posturing that has disfigured their post-war thought, they could perhaps recover their role as the great essayists of the world. We need a new Pascal, a new Montaigne. By 1997 the ubiquity of Puff Daddy helped cement hip-hop’s new image: the rapper as tycoon. Like all pop-music trends, like all economic booms, this one couldn’t last […] Because hip-hop is so intensely self-aware, and self-reflexive, it came to be known as big-money music, a genre obsessed with its own success. If we are now entering an age of diminished commercial expectations, that will inevitably change how hip-hop sounds too. ~ by ohkrapp on December 31, 2007.
thank you for these hot links. I especially appreciated the peak into Shane’s world by The Mirror. However, am I alone in wishing that The Mirror, esteemed publication though it is, would embrace the internet revolution and post more pictures? I could have used closeups of Shane, action shots, or a bit of the mise en scene.